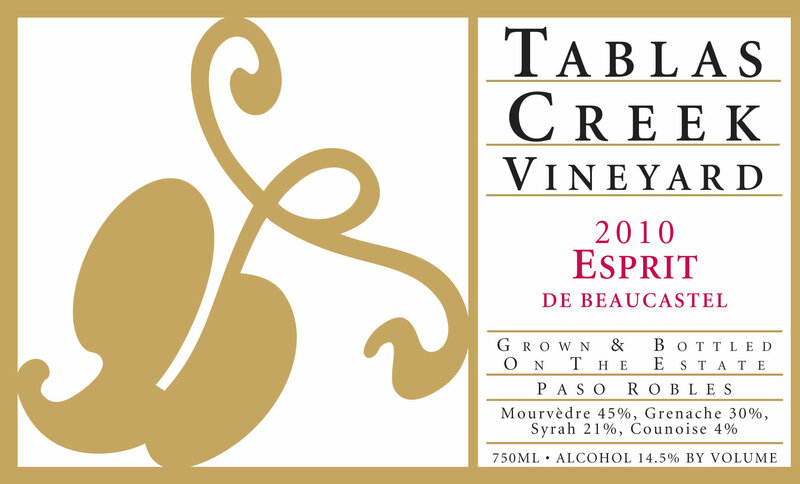 The Tablas Creek Vineyard Esprit de Beaucastel 2010 is a blend of four estate-grown varietals, propagated from budwood cuttings from the Château de Beaucastel estate. The wine is based on the dark red fruit, earth, spice and mid-palate richness of Mourvèdre, with additions of Grenache for forward fruit, approachability and lushness, Syrah for mineral, aromatics, and back-palate tannins, and Counoise for brambly spice and acidity. The 2010 Esprit de Beaucastel shows Mourvedre's signature currant, balsamic, black tea and roasted meat aromas, given lift by a brighter raspberry note and notable minerality. The mouth is richer than the nose suggests, with plum, blueberry, pepper steak and dark chocoloate notes. Well-mannered tannins keep order without blocking or weighing down the wine. This is an Esprit that will provide pleasure now, but which should also age gracefully for two decades. Updated tasting notes from a December 2014 vertical tasting can be found on the Tablas Creek blog. The 2010 vintage saw healthy rainfall after three years of drought. The ample early-season groundwater and a lack of spring frosts produced a good fruit set. A very cool summer delayed ripening by roughly three weeks, with harvest not beginning until mid-September and still less than half complete in mid-October. Warm, sunny weather between mid-October and mid-November allowed the later-ripening varieties to reach full maturity. The long hangtime and cool temperatures combined to produce fruit with intense flavors and dark color at low alcohol levels. Syrah was harvested between September 28th and October 13th, followed by Grenache between October 4th and November 13th, Counoise between October 17th and November 6th, and Mourvèdre between October 4th and November 18th. The grapes for our Esprit de Beaucastel were grown on our 120-acre certified organic estate vineyard. The grapes were fermented using native yeasts in open and closed stainless steel fermenters. After pressing, the wines were moved into barrel, blended, and aged in 1200-gallon French oak foudres before being bottled in July 2012.